You know them at first sight: teammates or colleagues, direct reports or bosses who radiate enthusiasm, positive energy and inspiration. Even in difficult circumstances they glow with an attitude that inspires others, fosters a great working experience for everyone and creates empowering relationships. Would you like to learn how to glow? 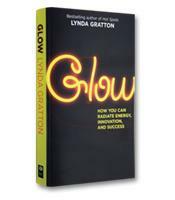 Author Lynda Gratton shows you how. Glow is an invitation to become more energized and innovative at work, and to radiate positive energy that will also excite and ignite others. You glow when you radiate positive energy and that fosters a great working experience for yourself and others. How to create Hot Spots — the times, places, and occasions when whole groups of people become highly energized and innovative. Why glowing depends on the three principles of a cooperative mindset, networking and igniting latent energy. How to tap into the three resources of glowing. How being able to cooperate with others is crucial to your capacity to glow.